Percussionist/Composer/Instrument Builder Nathan Hubbard works in many different fields, but in general his work shows a decided interest in exploring the possibilities of sound and embracing the passing of time. This interest in sound can be seen in everything from his extended sound language as an improvisor to his homemade and found instruments. The different rates of passing time become relevant as both a rhythmic impetus and defining element in his compositions and their changing definitions of form, shape and outcome. Musically his explorations range from solo improvisations through small group collaborations to large scale compositions for his twenty-six member large ensemble, Skeleton Key Orchestra. As a composer his works range from solo pieces to medium scale works for a variety of ensembles, works for tape, electronics and acoustic instruments, large works for orchestras, creative orchestras and traditional big bands as well as pieces involving text, voice and other media. In the last several years Hubbard has been more involved with musical situations incorporating acoustics, enviroments and field recordings. His work as an artist can be seen on several of his CD covers and his work as an engineer and producer can be heard on almost all of his recordings. His current projects include solo performances, collaborations with Curtis Glatter (Glatter/Hubbard) and ARC Trio, as well as leading his own quintet (Nathan Hubbard/Passengers) and the large ensemble Nathan Hubbard Skeleton Key Orchestra. In addition to all this work, Hubbard has performed and/or recorded with artists such as Jacob Adler, Roger Aplon, David Borgo, Paul Carman, Castanets, Alex Cline, Anthony Davis, Michael Dessen, Mark Dresser, Tim DuRoche, Brad Dutz, Harris Eisenstadt, Marcos Fernandes, Justin Grinnell, Vinny Golia, Phillip Greenlief, Rick Helzer, Bill Horist, Mike Keneally, Paul Kikuchi, Ted Killian, Steuart Liebig, George Lewis, Doug Lunn, Noah Phillips, Garth Powell, Rafter, Jason Robinson, Tim Root, Scott Rosenberg, Jim Ryan, Chris Schlarb, Theodore Sistrunk, Moe! Staiano, GE Stinson,Kenseth Thibideau, Kris Tiner, Bertram Turetzky, Phillip Wachsmann and Nazo Zakkak. 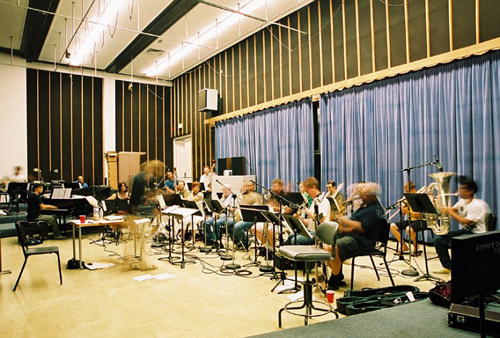 Skeleton Key Orchestra draws upon a wide cross section of Southern California's improvised and creative music world. Nathan Hubbard's compositions seamlessly blur the distinction between improvisation and composition and highlight the strengths of the 35+ members of the orchestra. In the tradition of jazz and large ensembles, Hubbard's music is influenced by the free jazz ensembles of Ornette Coleman, Mike Mantler, John Coltrane, Albert Ayler, Cecil Taylor and William Parker, the european ensembles led by Barry Guy, Alexander von Schlippenbach, Tony Oxley, Evan Parker, Wolfgang Fuchs, Peter Brotzmann and Pierre Favre as well as the West Coast ensembles led by Vinny Golia, Glenn Spearmen, Jeff Kaiser, Marco Eneidi, Scott Rosenberg, the NOW orchestra and the sorely missed New Art Orchestra. The music traverses an array of territories, from complex grooves to surreal electronic landscapes, free-wheeling high-energy collective improvisation to meditative woodwind fugues, improvised street marches to minimalistic repetition.